If you're pregnant with more than one baby, a healthy diet and lifestyle will help you cope with your pregnancy and give your babies the best start in life. The easiest way to get all the nutrition you need is to have regular meals and snacks. Eat at regular meal times and have one to two small snacks between meals. This will help keep your energy levels up. Have food from the four food groups every day. Choose at least six servings every day. A serving is one medium slice of wholegrain bread, ½ to 1 cup of breakfast cereal, or 1 cup of cooked brown rice or pasta. Choose at least 6 servings of vegetables and fruit every day. A serving is the size of the palm of your hand. Try to have many different colours of vegetables and fruit, as they all have different antioxidants and vitamins. Choose at least three servings every day. A serving is 1 cup (250 ml) of cow's milk or a calcium-enriched plant milk, 1 pottle (150 g) of yoghurt or 2 slices (40 g) of cheese. Choose at least 3 servings every day, including 1 of nuts and seeds. A serving is a piece of meat, chicken, or fish (the size and thickness of the palm of your hand), 1 egg, ¾ cup of tofu, cooked dried beans, split peas or lentils, or a small handful (30 g) of nuts or seeds. 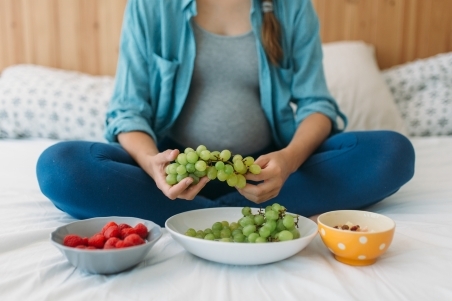 You may need more or less from each food group depending on your pre-pregnancy weight. Talk about this with your dietitian or LMC. Water and milk are the best choices when you're pregnant. Aim for nine cups of fluid each day. You'll need more in hot weather, after activity, if you're vomiting, or if you have diarrhoea or constipation. Cups of tea or coffee count towards your nine cups. However, having too much caffeine can affect your babies' growth. Have no more than six cups of tea or instant coffee each day (or three single espresso-type coffees) each day. Avoid energy drinks, as these are high in sugar as well as caffeine. Regular activity is also important as long as your pregnancy is uncomplicated. Activities such as walking and swimming will maintain your fitness and make your pregnancy more enjoyable. Ask for a physiotherapy referral from your LMC if you have back or ligament pain. Alcohol isn't recommended during pregnancy as the full effects of alcohol on your babies are unknown. Alcohol, even in small amounts will enter your babies’ bloodstream. So whatever you drink, your babies will get too. Being smokefree is recommended as smoking during pregnancy can slow down your babies' growth and development. During pregnancy your immunity is lower, so you and your babies are more susceptible than usual to food-borne illnesses. Follow food safety practices such as washing your hands prior to handling food, cooking foods thoroughly, and using cooked, prepared and canned foods stored in the fridge within two days. Keeping track of how much weight you gain in pregnancy is important for your health and your babies' health. This is especially important if you were underweight or overweight at the start of your pregnancy. To work out how much weight you should gain you need to know what your body mass index (BMI) was at the start of your pregnancy. See below for a guide to how much weight you should gain if you are having twins. There are no recommendations for how much weight you should gain if you're having triplets, but doctors suggest that you gain at least 23 kg. If you're concerned you're not gaining enough weight or too much weight talk to your LMC or GP. Written by Nutrition and Dietetics, Christchurch Women's Hospital. Adapted by HealthInfo clinical advisers. Page created August 2018. Goodnight W, Newman R. Optimal nutrition for improved twin pregnancy outcome. Obstetrics & Gynaecology, 2009. 114:1121-34. Ministry of Health – Eating for Healthy Pregnant Women, retrieved June 2018. Practice-based Evidence in Nutrition – Pregnancy: Multi-fetal, retrieved June 2018.